Poultry auctions can be a great place to buy new chickens or to sell a few chicks. They can also be intimidating if you're not sure what to expect at a poultry auction. 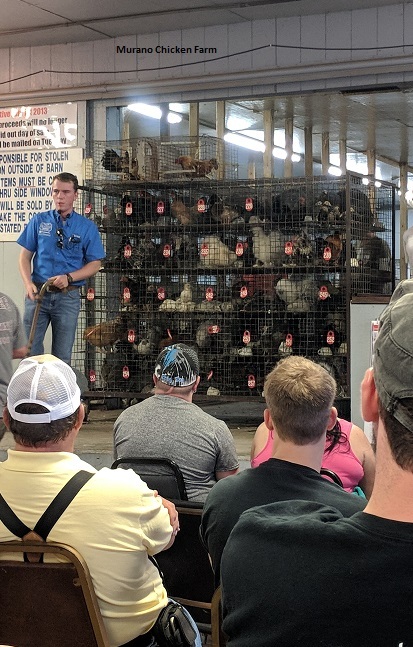 I've been to quite a few poultry and livestock auctions and since we've already discussed what to expect at a poultry swap, I thought I should tell you what to expect when you buy or sell at a livestock auction. 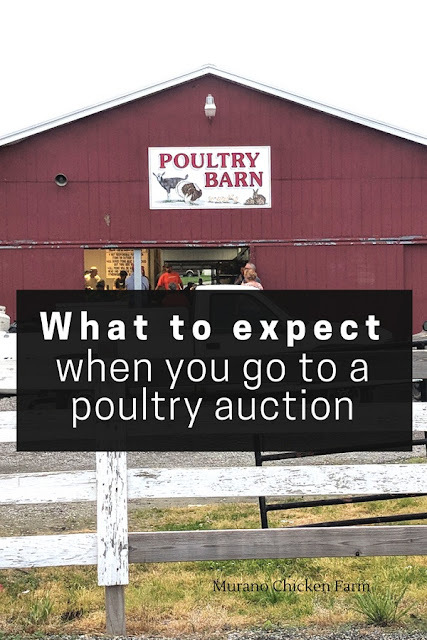 If you've ever been to any type of live auction then you'll have a good idea how a poultry auction is run. Most auctions are run in a similar manner, though adding cages of chickens to the mix can get a bit confusing. Not to mention smelly! Registration: When you get to the auction you'll need to register. They'll ask for your identification and you'll fill out a form with your information. You'll be assigned a buyer or seller number. Some places use the same number for both. The auction I go to has only required me to register once and my number has been good for the last 6 years. Other auctions ask you to register each time, so check to see how your auction does things. Sellers will need to bring their chickens at the appointed times. 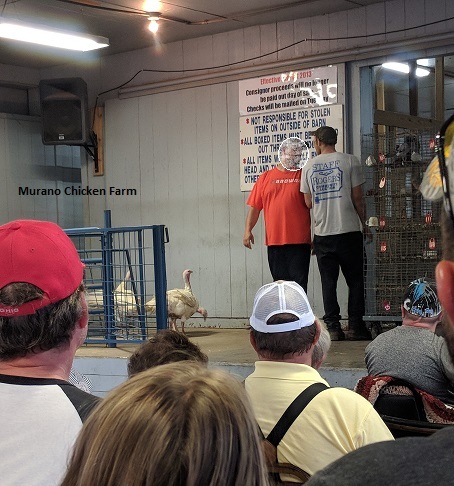 They usually open several hours before the auction starts, but often stay open to accept poultry all the way up till auction start time. Go to the registration window or table and tell them you're dropping off and they'll point you in the right direction. Some auctions have permanent cages that they use for poultry. These blocks of cages are on wheels and have numbered tags on each cage. This number will be recorded and your chickens put in a cage. These cages make bringing the birds to the auction room very easy as they just wheel out the whole block of cages. 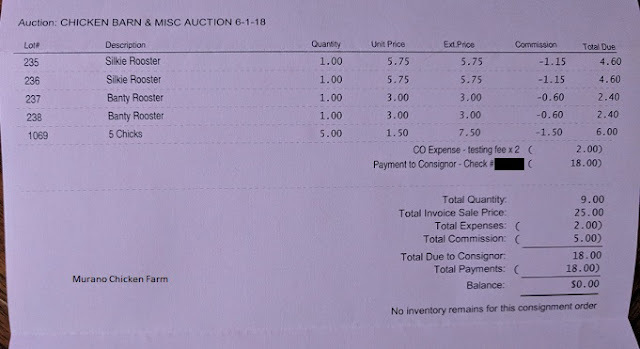 Other auctions ask that you supply the cages which you won't get back. In this case I usually duct tape poultry netting over the top of a box so the chickens have plenty of airflow and buyers can see them before the auction. You will usually have to supply cages or boxes for chicks. Even auctions that provide cages for adult birds don't normally have anything small enough to keep chicks from escaping. Plus a solid sided box with a viewing area will keep delicate chicks warm much better than a cage. When selling, I often separate the chicks into smaller groups. Not many people want 15 chicks, but lots of people have room for 3 or 5 chicks. If chicks are being sold by the box, you will usually get more money by bringing 3 boxes of 5 chicks, then you will for 1 box of 15 chicks! See poultry buyers section below for information on how to box up chicks depending on how your auction sells them. I also like to split chicks up by breed, but that's just my personal belief that I get more per separate breed than for a mixed box of chicks. Once your chickens are dropped off they may be blood tested. Some auctions do blood tests and the cost for these tests will be deducted before your are paid out. The auction I go to most often tests for Pullorum, but only in birds over a year old. After the poultry is auctioned off you will be sent a statement and a check. They will have deducted the sales commision and testing fees from the total sale amount. As you can see from my most recent auction, chicks didn't do well but the Silkie roosters didn't do too badly. Normally I can't even give them away! As you can see on this auction statement from 2013, sometimes auctions are quite lucrative! After registration you'll want to look at all the poultry for sale. Take a walk through the rows of cages or pens and look over each bird you're considering buying. You won't be allowed to handle the birds, but you'll still want to observe them as closely as you can for signs of illness or disease. I like to decide a maximum amount I will spend on each chicken at this point. I take notes to keep myself on track, writing down cage number and my maximum price. This helps keep overspending to a minimum as it's very easy to get caught up in a bidding war during the auction. It's also easy to get confused with the vast amount of poultry presented during the auction phase and to accidentally bid on the wrong one. At auction time they will bring items out either one by one, or in groups. Smaller poultry like chickens and ducks will be brought out caged but larger poultry might be walked out, like they did with these turkeys. The auctioneer will start chanting and it's pretty difficult to understand at first. My best tip to understand an auctioneer is to try to pick out the numbers and watch his gestures at the same time. Each time he acknowledges a new bid, he will gesture toward the bidder. Pick out these numbers from his chant to follow the price of the animal being auctioned. Here's a great example of a livestock auctioneer chanting. The reason they chant so fast is to encourage the bidding to move quickly...and with dozens of animals to auction, I can't blame them for not wanting to take all day! Buyers bid on items by either raising their buyer number or raising their hand. I strongly suggest you do not take this time to fix your hair, fan yourself with your auction number or swat at a fly buzzing near your face. You just might place a bid! Poultry often sells in lots but sometimes it sells per piece. Let's say you bring a box of 5 chicks to auction, it will either get one price for the whole box of chicks or the bidding price will be per chick. Some auctions will sell them per chick, splitting up the lot. So if the bidding gets up to $3 and ends, the buyer can decide whether they want all 5 chicks at $3 each ($15 total) or if they just want a few. Now let's say the buyer only wants 2 chicks. The auctioneer will then offer the rest to the next highest buyer for that price. If that buyer declines, the auctioneer will lower the price till he finds a buyer, or start again with bidding. This method keeps the auction from running on forever by auctioning birds off 1 by 1. Other auctions sell the whole box of chicks at one price. So if the bidding stops at $3, that is the price for the whole box of chicks. This is important to know before selling or buying! After the bidding is over you'll need to go back to the window to pay for your purchases. You'll then either be taken back to get your chickens, or they'll be brought out to you. Once you get home with your new poultry you will need to quarantine them for at least 30 days before adding them to your flock. Even if they have been blood tested, there is a whole host of other diseases and parasites the new chickens might be carrying. You want to make sure they have a clean bill of health before introducing them to your existing flock. An outdoor poultry auction is almost the same as an indoor poultry auction except all the cages are placed in rows on the ground. When the auction starts, the group walks around to each area with the auctioneer and the auction is held outside. Each cage will be labeled with the number it was given at registration and that is how you'll differentiate between auction items. An outdoor poultry auction is basically the same as an indoor auction but with more walking, weather and trying to see over people standing around the auctioneer. Buying and selling at an auction seems simple enough, right? If you're going to a poultry auction for the first time you'll probably want to observe for a bit before jumping into things. It's also important not to get carried away with bidding and to remember that there is really no accountability if things don't turn out the way you thought they would down the line. If what you thought was a purebred silkie doesn't produce chicks that look pure, or if the fertile emu eggs you bought don't hatch....you're pretty much outta luck. Which is exactly why I'm usually a seller not a buyer. You can get some amazing deals though, if you know what you're looking for. Good luck!